An ion exchange resin designed to actively trap phosphate, nitrite and nitrate. Absorbs and traps phosphate, nitrite and nitrate. Creates ideal conditions for plants and fish. Promotes crystal clear water. Phos-X Pond Phosphate Remover has different options and/or variations, please choose below. Create crystal clear water, reduce odors, and make an ideal living environment for your plants and fish. Phos-X absorbs and traps phosphate, nitrite, and nitrate quickly and easily. To reduce ornamental pond maintenance, simply place in filter wherever water will circulate through mesh bag. Treats 1,320 gallons for 3 months. 2 pack. Treats 5,288 gallons for 3 months. 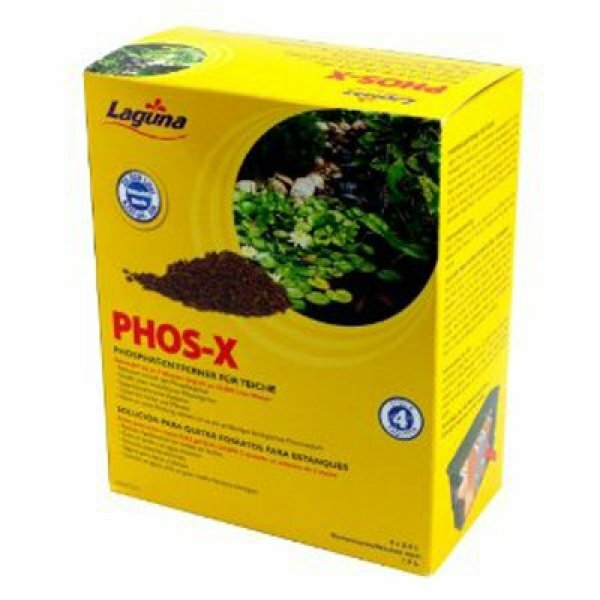 Phos-X reduces many of the compounds that encourage unsightly growth in ornamental garden ponds. Phos-X absorbs and traps phosphate, nitrite and nitrate within its matrix. Using Phos-X will promote crystal clear water, reduction of odors and will create the ideal conditions for plants and fish. This product works well in conjunction with Laguna Enviropeat, sold separately, to create a naturally beautiful water garden.